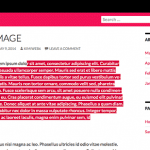 The default theme of WordPress current version is without question a great looking theme. Starting from having an option where you can have TwentyEleven sidebar on the right of left, you also have so many abilities to change your site’s background, working with drop down menu, etc. But of course apart of there are happy users about how this template looks, there must be some people who are not satisfied in some parts of this theme feature. I personally like the cleaness and all, but I don’t really like the Twenty Eleven comment bubble that shows up in index page or home page. I do really like the numbers where displays how many comments you are having, but I don’t really like the bubble’s image as the background. 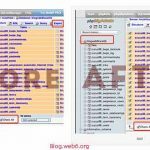 Of course you can replace the image, but in this post, we will not discuss about changing or replacing the image, but I will show you how to remove Twenty Eleven’s comment bubble. As mentioned in above paragraph, we will completely remove the bubble’s background and the number. 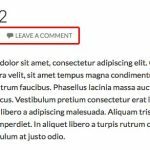 After it’s all removed, we will add the code where it will display the usual standard comment number and “leave a comment” text under your blog post title. (related: good blog title or names). The number of comment is now moved. In the screenshot above, you see that after the blog post’s title (red highlighted), we will have the “Posted on” wording, and then author, and the numbers of the comment that post has. Notice that in the default TwentyEleven theme, it won’t show that number, but showing Twenty Eleven comment bubble. In this case, you can replace that wording as you wish. I will show where, in the coming paragraph. 1. 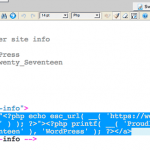 Access your blog files (wp-content) via FTP or login to your cPanel, and go to wp-content folder, and then “theme” then we will copy original content.php of TwentyEleven theme and copy it into child theme. 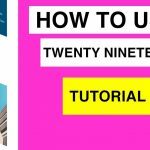 (Yes, we are using TwentyEleven child theme in this demo, for reference, my previous video tutorial how to create Twenty Eleven child theme video). 2. Now inside the child theme folder (in this demo, I name the folder as, “MyTwentyEleven”), open content.php by clicking “code editor” icon in your cPanel. You can comment that code, or delete them, in this tutorial, I deleted them. Note: The red font of the codes above, is the part that you can replace with wording or text as you want. 5. Save files whenever you make changes, and refresh your browser to test. If necessary clear your cookies. That’s how we can remove Twenty Eleven comment bubble. I like this tutorial! Using the twentyeleven theme, and the dark color scheme, I’m having a tough time making the navigation completely black #000000 and the blog area completely black #000000. I don’t want almost black, I want completely black. Can you do a tutorial on how to do this? Thanks! I like your tutorial! it’s very useful for me as newbie like me =) But I have a question. 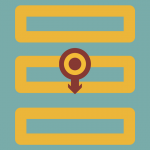 I have a “wordpress” at the left bottom at the footer. Can I ask how do i remove it? Welcome to my blog, and thanks for your nice words. I am planning to post a tutorial about it, but due to new year holidays, it may need some times. 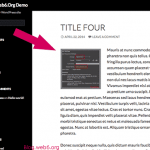 And then try to alter footer from this local blog. Thanks! i will check your video out! Happy New Year to you too!! i think the child theme editing way is excellent. do you think its better to simply remove all these comment code blocks if my website is not going to have any comments on it? either for pages or for blog? it will be comment free. too much spam to deal with. 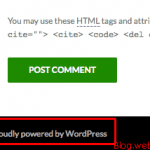 I wanted to thank you for your excellent tutorial & video on comment modification in WP. I used your techniques to customize our customer testimonial pages at http://www.ChintiminiFarm.com. I felt it was important to change the default behavior of WordPress comments in the twenty eleven theme, because I did not want to make users have to perform an additional step (clicking the “X replies” link) to have to see nice testimonials. I was able to use your technique, plus the template hierarchy, to display full comments for a designated category (“testimonials”). So I’m very, very happy. Thanks again! Thanks, this works great for STANDARD format posts. But it does not remove the bubble from IMAGE format posts. Do you know how to do that?